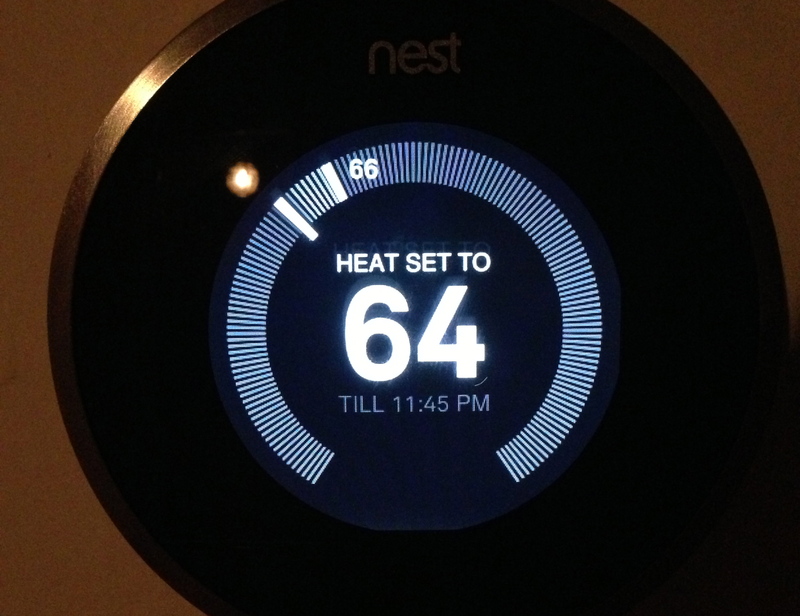 If you frequent tech-centric websites, you’ve surely heard of the Nest thermostat. It’s basically what happens when an Apple product designer turns his attention to the home thermostat. And that’s not a metaphor. That’s exactly what happened. It’s been out for over a year, but Nest released a new model this past fall, and that’s the one I got. The device is sleek and intuitive. Its scrollwheel-based design apes the click wheel of the early iPods. 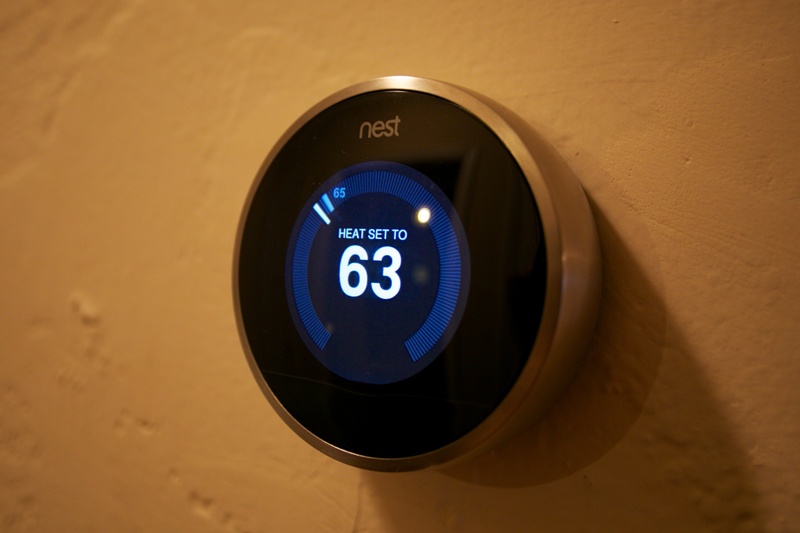 Functionally, the main conceit of the Nest is to learn your habits and preferences, so your home is always the temperature you want it to be, not a degree more or less to save energy (not to mention money). 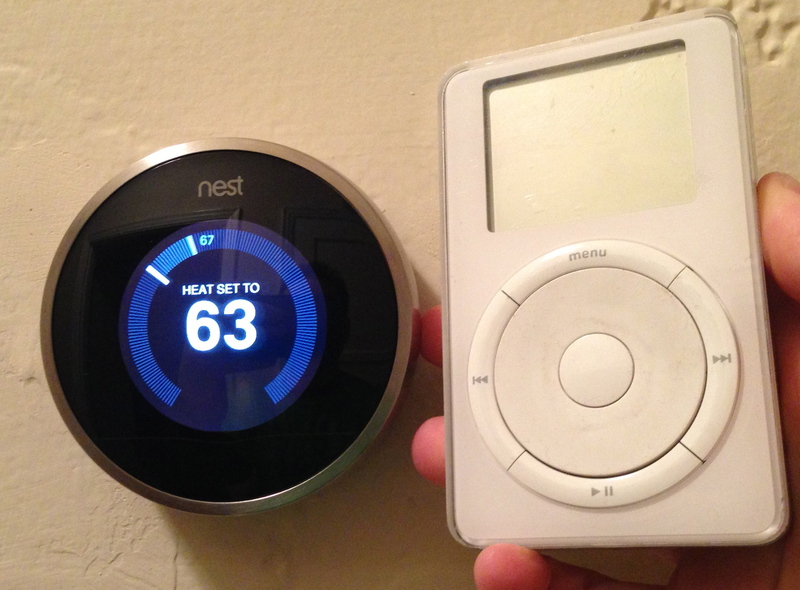 If you’re a gadget nut, this is the thermostat for you. If you’re eco-conscious, this is the thermostat for you. If you’re money-conscious, this may be the thermostat for you. For me, it was a no-brainer since I’m all three of those things. I knew I definitely wanted a “smart” thermostat in the new house, and by “smart” I mean one that is both high customizable AND controllable via the internet & smartphone apps. Our alarm company offered a smart thermostat for $180, but I could easily justify the additional $70 bucks for the Nest because the Nest is not only more sophisticated than theirs, but it’s also sharper looking. Remember, this thing is going to be on your wall. A nice design certainly can’t hurt. Quick note on its design: The Nest’s “classic” round appearance is modern but understated, and fits just about any room design. After using it for a couple months, I don’t regret the purchase at all. It was easy to install and set-up on my own. The one time I had to call their tech support, they were responsive, friendly, and knowledgable. Thanks to its web interface, it’s super easy to program. There’s almost no learning curve. The “auto-away” feature. Its motion sensor knows to turn off the heat or AC if there’s no one around after a period of time. Very smart. Every thermostat needs this feature. One thing that doesn’t work as well as I’d like — the algorithms it uses to “predict” what temperature you want when you want it. Ideally, after a few weeks of use, you shouldn’t need to ever manually adjust it. But I still find myself tweaking it even after three months. Part of that may be because it was used highly irregularly for the first month (before we moved in). It could also just be that I find the Nest’s manual programming options too tantalizing NOT to use. For example: This winter, I’ve set it to get warm during the evening, then cooler when we should be asleep, then start to warm up again right before our alarm clock goes off in the morning. Another thing that’s lacking: It keeps a history of your energy usage, but it doesn’t go that far back, just a couple weeks. Though handy, the ability to track energy usage from month-to-month and year-to-year would be much more useful. See it? No? Okay. Fine. It’s the use of TILL to mean UNTIL. It should be ‘TIL with an apostrophe. Till is something you to do soil. (Yes, I know some online dictionaries now include the “until” meaning for “till” but those online dictionaries are dead to me). So that’s the Nest. If you like having home appliances that connect to the internet for ultimate control, it’s a must-have… unless $250 is just too much for you to spend. In that case, see what your alarm company offers. You probably won’t get all the same features, but it should be a little cheaper.